Now we're all raspberry jam fans, but imagine adding prosecco into the mix. This seeded raspberry jam is made using Silver Spoon Jam Sugar. This sugar contains the right amount of natural pectin that certain fruits lack, it helps ensure the jam sets quickly and retains its fresh fruity flavour and natural colour. 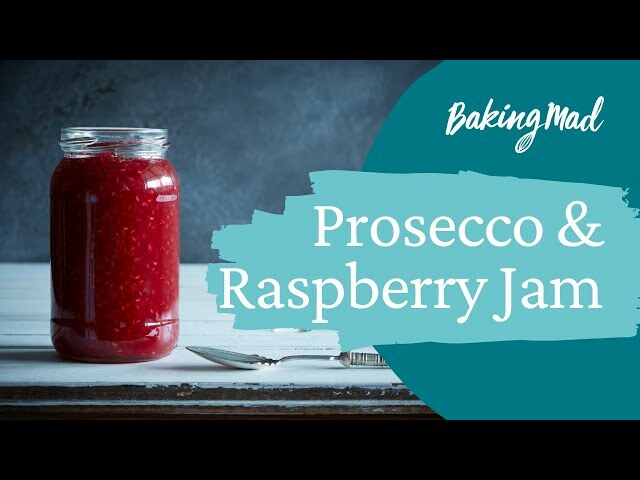 The added prosecco gives this jam a wonderful flavour and is great spread on a slice of toast. This would be the perfect recipe to make ahead and give out as presents to loved ones and just to have in your own cupboard for a breakfast treat! Place the washed raspberries in a large saucepan over a low heat and allow it to simmer for around 5 minutes. Make sure the raspberries are stirred every so often to make sure they don't stick to the bottom. Add the prosecco and make sure it's mixed through with the raspberries. Then add the Silver Spoon jam sugar and stir gently until fully dissolved in the mixture. Whist the sugar is dissolving, you need to sterilise your jars. Heat oven to 140'C/120'C fan/gas 1. Wash the jars in hot, soapy water and then rinse well. Place the jars on a baking sheet and put them in the oven to dry completely. Top Tip: Rubber rimmed jars? Increase the heat of the jam to a rolling boil. This means you see the surface of the jam boil rapidly with lots of bubbling. After 15 minutes you can test to see if the setting point is ready (If you have a jam thermometer, it should be at 105'c). Use a cold plate and place a spoonful of the jam onto it. Leave it for a minute and then push your finger through it. You should see it wrinkle. If the setting point hasn't quite reached, continue to boil the mixture for another 2-3 minutes and use the same plate test to test for wrinkles. It's important it does wrinkle so make sure you reach this stage by repeating if you have to before the next step. Leave the jam to cool for about 10 minutes and then remove any surface scum from the surface with a spoon before pouring into the sterilised jars. Seal the jars and store in a cool dark place. How much does this recipe make? I know it says 6 jars but how much is that?